All buy and sell orders are automatically escrowed in the Bitcoin blockchain itself until they are completed. The Counterparty exchange is decentralized and peer-to-peer. This means that there is never a third party or middleman (such as a server administrator, traditional exchange, clearing house, or bank). This kind of trading is called ‘trustless’, because you do not have to trust anyone to handle your funds and complete your trade correctly. Placing and cancelling orders requires the Bitcoin network to confirm these transactions, which may take some time. Some Counterwallet features may be restricted due to regulatory uncertainty in certain countries. This does not mean that they are disabled in the decentralized exchange. These features are simply hidden from the user interface by default to avoid legal issues. Like Bitcoin, Counterparty exists without international borders. So it is absolutely possible to use any of the features in any country by running your own copy of Counterwallet or Counterparty-cli, but please make 100% sure you are operating within the law before attempting this. Disclaimer: All Counterwallet (and therefore Counterparty) actions are Bitcoin transactions. And because anyone can make a Bitcoin transaction, anyone can create a decentralized token. If this concept seems confusing, consider that Bitcoin functions entirely without a central bank. This is an identical ‘free-for-all’ scenario. It is fundamentally impossible to have an ‘owner’ and or ‘admins’ at such an exchange. Escrowed funds are provably inaccessible until peer-to-peer orders are successfully matched, and all completed orders are irreversible. Counterparty (the open-source Bitcoin toolkit for financial instruments and markets) itself cannot distinguish whether tokens are legitimate, so please ensure due diligence before trading. Always research the official website of the token you are trading, its page on XChain and (if applicable) its thread on Bitcointalk. 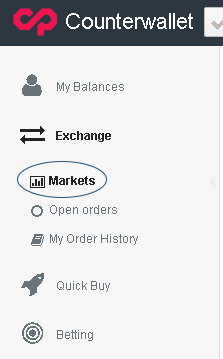 Click Exchange -> Markets on the sidebar menu. You will see the pairs with the most current activity. Clicking on these will forward you to their orderbook. 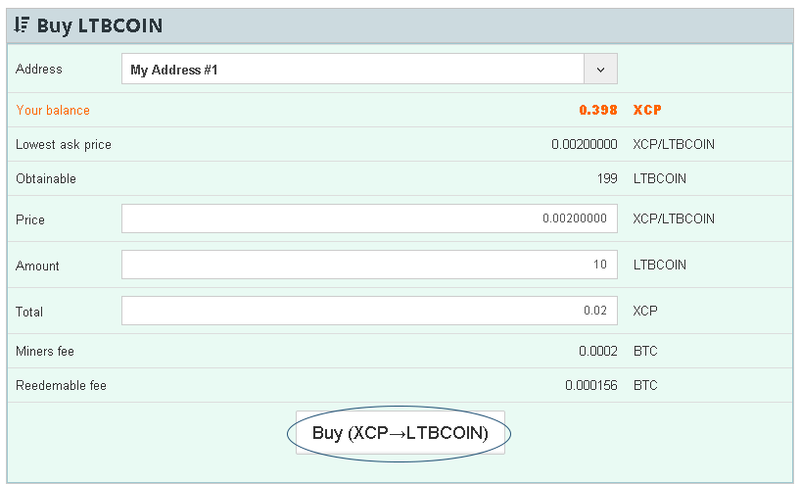 You can also specify a custom token to trade, if it does not appear in the top pairs list. 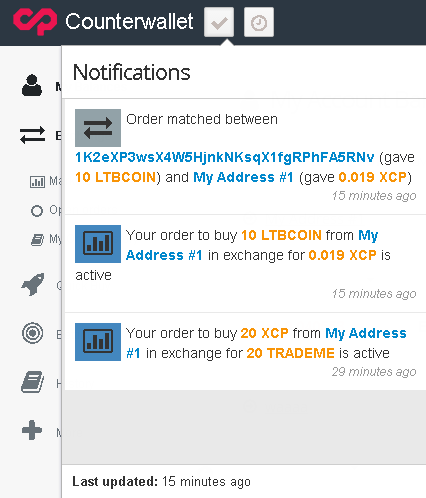 Using this interface you can choose which of your addresses you are using to trade, and place orders directly. Below this interface, you can look at the current orderbook for that pair. And below that is a listing of previously completed trades, if there are any. 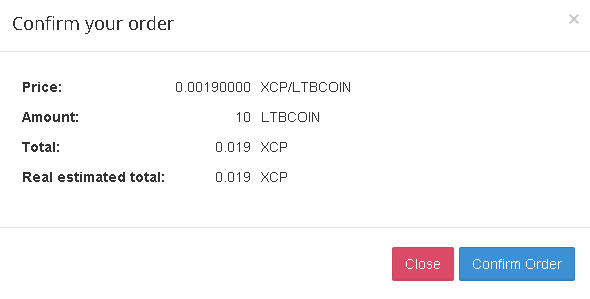 Let’s try to buy 10 LTBCOIN just as an example. Set your desired price and amount, and press Buy. 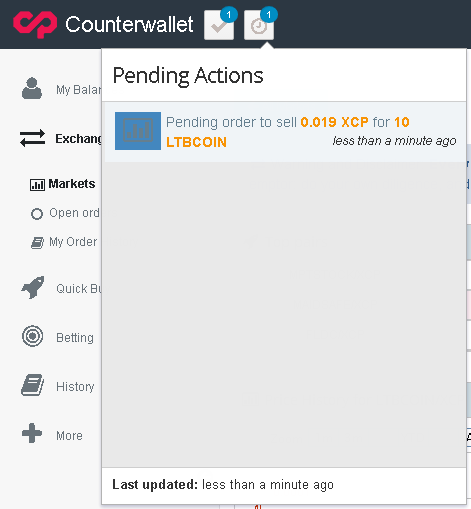 Counterwallet will ask you to confirm your order to make sure everything is correct. The order will now take some time to become valid and visible, while it is processed by the Bitcoin network. 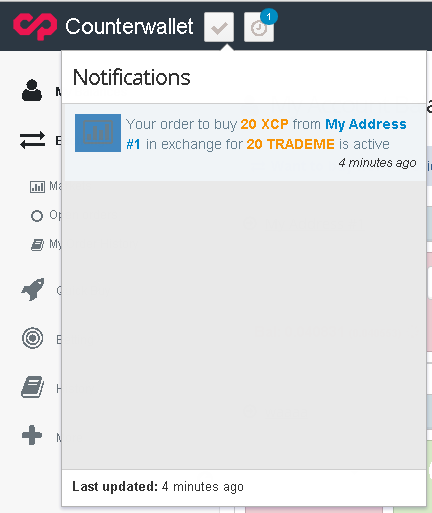 You will be able to see the pending order by clicking the clock in the top left of the screen. If you click the check to the left of the clock, you can see orders that have already been confirmed. After a while, you will be able to see that the order confirmed. And if there is someone selling for the price that you are buying at, the order will be matched and completed automatically. Join our mailing list for updates. We respect your privacy. As Counterparty is a global Internet-based technology, please be aware of the laws of your jurisdiction before using Counterparty technology. The Counterparty Developers do not condone the use of this technology for activities that may be unlawful in a particular jurisdiction, and explicitly disclaim responsibility for the independent actions of any third party utilizing this software. Counterparty.io and Counterwallet.io do not make investment recommendations and do not provide financial, tax or legal advice. Any asset or other financial contract displayed is for illustrative and informational purposes only and is not intended to act as a recommendation to buy or sell a particular asset or contract. Peer-to-peer trading is inherently risky. System and network response and access times may vary due to market conditions, system and network performance, and other factors. Peer-to-peer assets and financial contracts involve substantial risk and are not suitable for all individuals. Please understand these and other risks prior to using peer-to-peer networks such as the Counterparty Protocol. Counterparty is licensed under the MIT License and the CDDL 1.0.